Terry Fenton B.Sc. (Hons) F. Arbor. A.
Terry Fenton has gained a wealth of experience in tree and woodland management since first joining the Forestry Commission back in 1978. 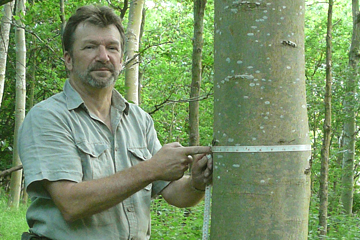 Over the last twenty plus years he has built an excellent reputation as a skilled and knowledgeable arborist and forester. He specialises in broadleaved silviculture, combining woodland management for conservation and amenity with timber production. A loyal and varied client base includes local authorities, parish councils, charitable trusts, businesses, farmers and individuals. He is a Fellow member of the Arboricultural Association. The quality of his work was recognised in 2002 when he won a 1st and 2nd place in the Woodlands & Plantations Competition organised by the Royal Forestry Society.